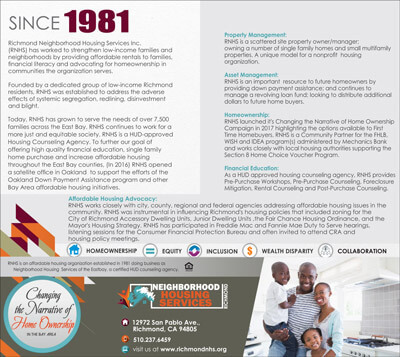 About Richmond Neighborhood Housing Service, Inc.
Richmond Neighborhood Housing Services, Inc. (RNHS) has a long rich history in the City of Richmond. It has provided housing services to Richmond residents since 1981. RNHS was founded by dedicated low- income Richmond residents to address the housing needs within the community and was created to strengthen low income families and neighborhoods through the development and management of housing projects. RNHS has served hundreds of families and individuals in jeopardy of losing their homes. RNHS has developed, acquired and/or rehabilitated over 400 single family homes including housing developments in blighted and vacant lots to sell or manage as affordable homes to purchase, or rent for low- income families. RNHS has also served residents through our education programs that include financial literacy programs, home loan programs, foreclosure prevention, and affordable rental counseling. The cornerstone of the organization’s mission is to ensure that East Bay (specific areas include Richmond, El Cerrito, San Pablo and Pinole) and County residents have access to affordable housing (by definition of those incomes below median levels) and rents; while staying relevant to the current housing crisis conversation taking place in the Bay Area. Currently RNHS is looking to add additional services to its platform to ensure the organizational relevancy. The landscape of housing services has changed in the City of Richmond; currently RNHS is the only organization with an active concentration in the development and acquisition efforts to secure properties for low income families. The AHEAD grant will be instrumental in our efforts in developing the next stage of our work; this work includes the promotion of homeownership and affordable rents, and launching an advocacy component to ensure that under represented and underserved communities within the area RNHS ( Richmond, El Cerrito, San Pablo, and Pinole) serves are not ignored as significant dollars (NHTF- National Housing Trust Fund) are distributed through communities to address the rental housing benefiting extremely low income (ELI) households (75%) and the needs of very low income (VLI) households(25%) serving communities that have been labeled to have the greatest disparity related to income and housing. RNHS continues to work for a more just and equitable society. More information on our affiliations can be found at www.hud.gov. Graduate of University of San Francisco with a Master’s Degree in Organizational Development; has worked in banking for the past 20 years in various positions with banks. Currently, serves as Vice-President/Relationship Manager at Tri-Valley Bank in San Ramon. Prior to entering the world of banking, she worked in the airline industry for 17 years in Detroit, Michigan in Operations and San Francisco in Sales as an Account Executive in the Financial District. In addition to serving on the board of NHS, she chairs the board of Opera Noir an organization dedicated to identifying talented young people of color and helping them get into the classical arts. She’s also a member of the board of directors of Progressive Transitions a non-profit dedicated to helping women break the cycle of domestic violence victimization and she volunteers for the Oakland Symphony. Niels Povlsen is a specialist in developing and managing profitable programs, departments, and operations. Niels has over 32 years of Title Insurance and Escrow experience. 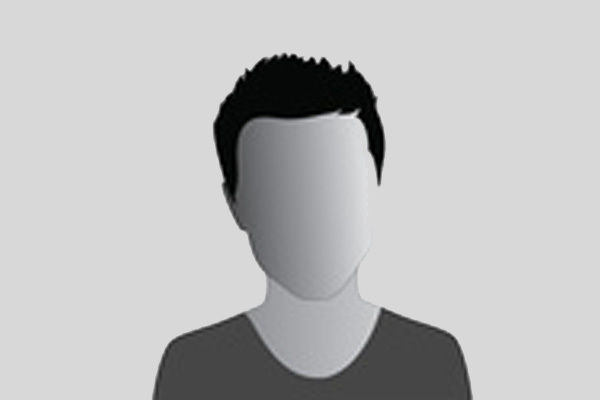 His experience is emphasized with expertise in Management and Sales. Niels has worked with high-profile companies such as Fidelity National Title Company, First American Title Company and Transamerica Title Company. A leader in his community, Niels is affiliated with organizations such as the NAIOP, ICSC, Oakland Chamber of Commerce and Wire. He is also co-founder of a Bay Area adult singles cycling and hiking club, Hikanbyke. The club’s 450 members range in age from mid 40’s to mid 70’s. Members are involved in a multitude of group activities, in addition to regular hiking and cycling events. Nikki A. Beasley, a Licensed Financial Professional for over 25 years in the Retail Banking, Insurance and Investment Industry is currently the Executive Director of Richmond Neighborhood Housing, Inc. She has an innate spirit for Entrepreneurship; She was the principal and founder of B.Wise Consultants, Inc.- a Financial & Professional Consultant firm designed to educate and motivate individuals to take proactive steps toward their financial independence through one-on-one consultations, and public speaking engagements. Ms. Beasley was a contributor to the national publication GLOW an entrepreneur magazine, a handbook for women business owners. Ms. Beasley founded Rite to Royalty a nonprofit dedicated to providing financial literacy to the undeserved and youth. Some of Ms. Beasley’s Professional and Educational accomplishments include: Life and Health license along with the 63, and 7 securities license; a B.S. Degree in Business from the University of Phoenix. 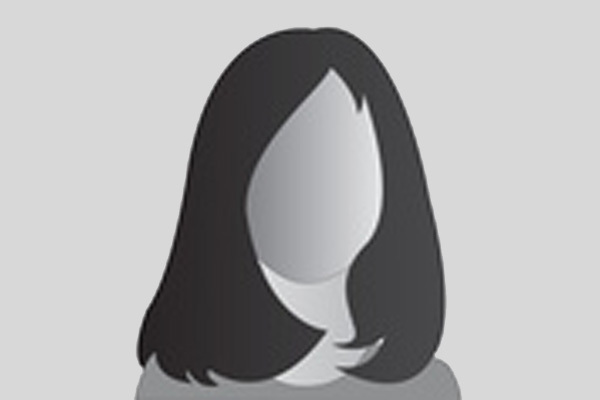 She is currently pursuing a Real Estate license with a concentration in multi-family units and commercial buildings.